That was terrible. It's the worst thing I've seen from A Certain Magical Index, which until this I'd always enjoyed. (I hadn't yet seen INDEX III at this point, though.) Theoretically there's not much to separate it from any other story arc in the show, even being written by the original light novel author, but unfortunately it makes some big mistakes. PLOT: Academy City has a space elevator, which is a thread-like tower reaching up into orbit. They used to run space planes, but there was an accident three years ago and it was a miracle that no one died. (That's the official story, anyway.) However the magicians are gathering. There's something about that space elevator they don't like, although they're being secretive about exactly what. MISTAKE #1: no one knows about magic. Touma goes berserk with Comedy Concealment Attempts whenever Index casually mentions it. The Academy City authorities have no idea that magic exists. The commander of Academy City's Black Crow Unit, Shutaura Sequenzia, is some kind of stupidity mascot, with the kind of idiocy that has its own event horizon. This is how she reacts when Touma says the word "miracle", for instance. "Don't use that word in front of me! The only things that have happened have been a bunch of coincidences. The only real things are coincidences resulting from quantum mechanics and people's greedy wish for a convenient outcome to them." The problem with all this is that I've seen all of INDEX seasons 1-2. Magicians have trashed Academy City and tried to destroy the world. They're everywhere. I'd be gasping with relief when we got an episode without one. Shutaura's position would be defensible in the real world, but in this fictional universe she's like a fish that refuses to believe in water. MISTAKE #2: at their worst, the action sequences are unwatchable. I mean that literally, by the way. After the first one, I assumed I'd missed something and rewound to rewatch it. Here's a summary of what happens. 1. A magician rises from the river and makes a water spike. 2. Touma pushes Arisa to the ground. It's not made clear why to the audience. 3. There's lots of wind. It's not clear who's attacking who, or even that it's a battle in the first place. Who's on who's side? It is water vs. wind, or both of those vs. Touma and Arisa? 4. Now there's a fire blast. Good, that's an improvement. We know that's Stiyl's trademark, so he's involved somehow. Stiyl tells off the first two witches, who call him Master, and Touma asks what's going on. GOOD QUESTION, MATE. 5. Stiyl attacks Touma, telling the girls to grab Arisa. 6. Arisa shouts and a bridge falls down. 8. Something invisible opens fire. We become aware of high-tech beetle-shaped vehicles. Again, no clarity and no one's getting any kind of introduction. It's unclear who's under attack and who's trying to achieve what, although we can tell that the magicians aren't happy. 9. Hang on, there are four of them! Did I miss something? Where did the fourth magician spring from? 10. "We are here under approval of Academy City's Board of Directors. We are the Civil Affairs Resolution Intervention Unit." (So they weren't attacking at all, but were just breaking up a fight?) "We will now engage in emergency intervention." 11. It's just not clear what this action scene is trying to be. What are the combatants trying to achieve? Is it even technically a combat? All I see is lots of exciting action of the kind that makes your eyes glaze over. Things move fast and there's wind. 12. Kanzaki appears and orders the magicians to withdraw. MISTAKE #3: probably the most unlikeable Index to date. She complains that Touma treats her as a child. "It's probably because you're cute!" suggests Arisa. No, it'll be because you're child-sized, bratty, bitey and usually useless. 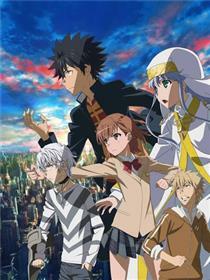 Index is entirely dependent on Touma, making no attempt to earn or take responsibility for anything. Her size suggests that she belongs in primary school. "Touma makes food and I eat it. He also comes and saves me when I'm in trouble." MISTAKE #4: the franchise's best characters are just getting wheeled on for "blink and you'll miss them" fan-pleasing cameos. The RAILGUN cast show up, which is nice. I think this is Saten's INDEX debut. However they don't really matter to the plot and it would have been a simple rewrite to remove them. The Misaka sisters made me enormously happy by appearing at 56 minutes (which was the first time I'd been delighted by this film), but they then immediately disappear again. Everyone (including Accelerator) gets their own cool moment at the finale, but that's not the same as actually having them involved in the story. MISTAKE #5: other logic lapses. Touma has declared that he's going to oppose the magicians' plan to prevent the destruction of the northern hemisphere. "We thought you'd say that, so we've got you some help." Eh? There's also a co-pilot in the space plane flashback who's beyond stupid, although I'm getting nitpicky about a throwaway moment there. Where does he think he's going? Does he think abandoning the plane's controls will improve his survival chances? Surely pilots (especially space pilots) are chosen carefully to avoid people like that and ensure that you'll have cool heads in a crisis? The film's basic story is okay, I suppose. If you fixed all the bugs, you'd be left with an unremarkable INDEX story arc. I might make it a two-parter. The revelations at the end are okay and I quite liked Arisa, but the "power of song" resolution made me think that this would have been funnier as an idol anime. I liked the cool bits, e.g. Misaka taking out a Tachikoma from Ghost in the Shell. (Well, that's what it looked like to me.) However that adds up to a film that's about 1% cool, 80% okay-to-mediocre and 19% stupid and annoying. Avoid it.